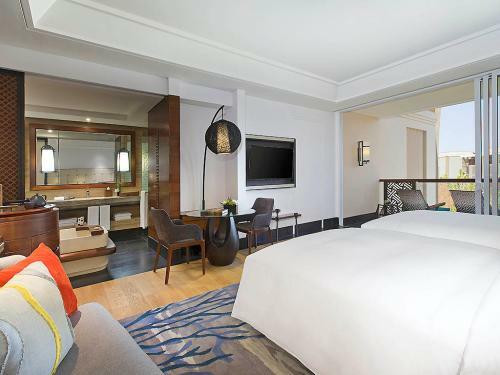 Nusa Dua's only French heritage instilled luxury 5-star beachfront resort with 8 hectares of tropical gardens, modern architecture and sophistication in every detail. The resort offers a collection of 415 well-appointed rooms including 39 suites and villas alongside complete resort facilities: 2 restaurants, 3 bars, Nikki Beach Bali, So FIT, So SPA, Vietura Bali Aesthetic Clinic, outdoor and indoor kids club and 12 function rooms including one Grand Ballroom and one Beachfront Ballroom. 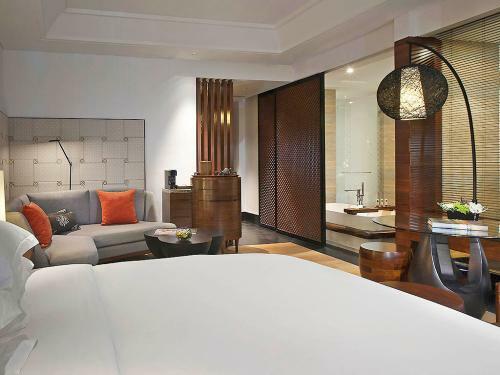 Located within the exclusive and serene five-star beach resort enclave of Bali's famous southern peninsula, Sofitel Bali Nusa Dua Beach Resort is a sumptuous retreat within close reach to Bali's tranquil eastern coastline of Nusa Dua. 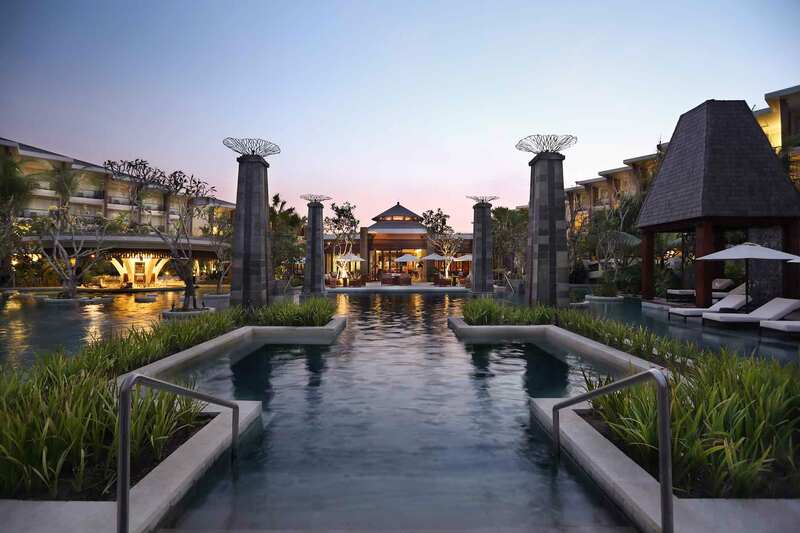 Nusa Dua is home to the Bali Collection shopping, dining & entertainment centre, Bali Nusa Dua Theatre, and the Bali National Golf Club. It's 30 minutes' drive from the airport and a short-drive north to the water sport coastal area of Tanjung Benoa. 48 m² modern living comfort featuring lavish fittings, LCD TV, private balcony, a luxurious bathroom comprises separate tub and rain shower with distinctive bathroom amenities, and complimentary internet up to 1MB. 120 m² (1290 sq. 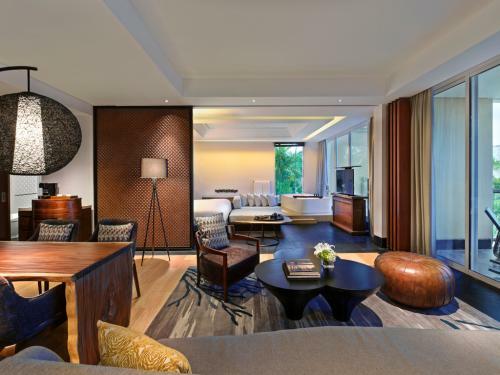 ft.) suite with private balcony, living and dining area, a luxurious bathroom with separate rain shower and Hermès amenities, butler service, and complimentary Internet up to 1 MB. 88 m² (945 sq. 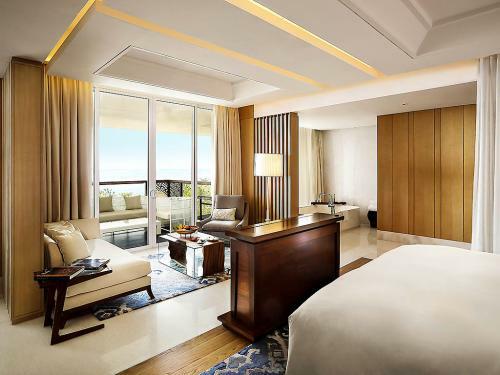 ft.) suite with ocean view, spacious living and dining area, private balcony, marble bathroom with rain shower and Hermès amenities, butler service, and complimentary Internet up to 1 MB. Lavish 88 m² (947 sq. 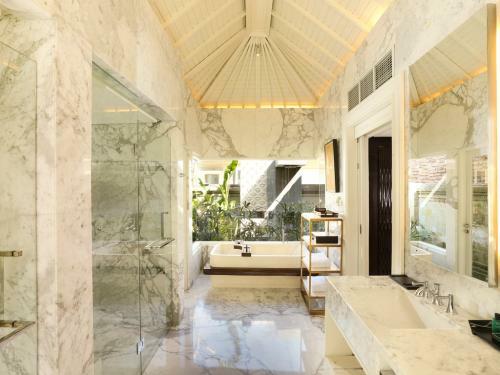 ft.) villa with private terrace and plunge pool, living room, marble bathroom with separate tub and rain shower, Hermes amenities, butler service, and complimentary internet up to 1 MB.